Death Defying Acts (2007) is just one of those DVDs which I grabbed off the shelf without thinking. I must admit, I never really wanted to watch it that much, but I thought it was a good enough film. I'm not the biggest Catherine Zeta-Jones fan, and I've never really thought of her as an actress. But seeing this, I think I can finally see her as an actress, and not as that chick who's married to the real old guy who was in Ghosts of Girlfriends Past. The title, 'Death Defying Acts' was a bit iffy. I guess I was expecting a lavish film about acrobats in a circus, but I was wrong about that. Rather, it was about a faux-psychic, Mary (Zeta-Jones), who is very poor, and often is an act at a local club with her daughter Benji (Saoirse Ronan). 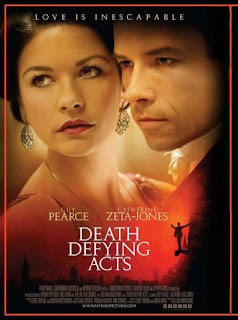 She meets a famous magician/daredevil, Harry Houdini (Guy Pearce), who is trying to connect with his dead mother's spirit. Mary looks like the woman for the job, but Houdini ends up falling in love with her, and romance ensues. It was a beautiful work of art, I mean the sets were fitting for the time period (1929). But the story is tough and go. Right throughout it, I got very confused as to what Mary was trying to do. The romance between Houdini and Mary wasn't very believable, because of the lack of chemistry between the two actors. Mind you, life would have been pretty grim for Mary, especially because she lived in a graveyard. This is one of those movies that you are meant to just grab off the shelf if all else fails. It's not particularly outstanding yet not that bad. The end is pretty sad, so you might want to get a few tissues with this. But only watch if you're desperate.